Brebes, Central Java – Today, Toyota Indonesia through Toyota Forest Program (Thursday / 1st March, 2018) again showed concern for the surrounding environment by doing afforestation activities in by doing planting about 70,000 Mangrove Tree in 6 hectares area located in Pandansari Mangrove Tourism Area, Kaliwlingi Village, Brebes, Central Java. This initial planting is part of Toyota Indonesia's target to plant and maintain 300,000 mangroves in a number of areas along the Java island north coast spread over in Thousand Islands (DKI Jakarta), Karawang, Brebes, Batang, Kendal and Surabaya in 2018. This inauguration ceremony was attended by General Secretary of Ministry Environment and Forestry Ir. Bambang Hendroyono, MM; PLT Governor of Central Java who also serves as Vice Governor of Central Java Drs. H. Heru Sudjatmoko, M.Si; and the Regent of Brebes H. Idza Priyanti A.Md. SE and Board of Directors and Management of PT TMMIN. On the same occasion, Toyota Indonesia also invited various environmental non-governmental organizations such as IUCN (International United for Conservation of Nature), WWF (World Wide Fund for Nature) Indonesia, and Indonesian Biodiversity Foundation (Hayati) to see directly the efforts of Toyota Indonesia to participate in maintaining the ecosystems diversity. With the slogan "1 Tree, 1 Car" which every production of one Toyota car in Indonesia, then one tree will be planted. Toyota Forest program is in accordance with Government policy related to environmental conservation and development of potential economic aspects from society in each region. The selection of mangrove trees has the benefits of carbon offset, cultivating the biodiversity and giving more value-added to surrounding society through Income Generating Activity (IGA). Along with the target set by Toyota Indonesia to do afforestation in Java coast, the planting of tens of thousands of mangrove trees is expected to overcome environmental problems in the midst of extreme weather conditions that currently hit Java and surrounding areas. "As the automotive industry since more than four decades in Indonesia, we have the noble need to maintain the balance of nature, environment, and ecosystem especially with mangrove planting. The "Mangrove for Life" activity that we have implemented since 2013, can only be actualized by the support of the government and local people in actualizing the afforestation in the North Coast Coast of Java Island," said Nandi Julyanto Director of Production Engineering & Vehicle Manufacturing PT TMMIN. On this planting of mangrove trees, Toyota Indonesia is focusing its activities in Pandansari Mangrove Tourism Area, Kaliwlingi Village, Brebes Central Java. The selection of this location is based on the success of local society to rehabilitate their affected villages so that it becomes an abrasion-free mangrove conservation area. Besides that, other thab to prevent natural damage, the presence of mangrove forest can also be used as a unique tourist attraction for local people it can even provide mangrove processed products which is crab cultivation. Surely Toyota Indonesia will continue to participate and play an active role in spreading the green spirits to other areas that have been planted mangrove therefore it would grow such Pandansari Mangrove Tourism Area Brebes. The condition of coastal Java Coast that is vulnerable to natural disasters from abrasion to big flood requires protection in the presence of mangrove forest. Disasters that often occur in the coastline is very harm to citizen, especially around coastal areas. Abrasion is triggered by tidal waves in the sea that cause the sweeping coastal areas. Tidal waves generally occur due to strong winds, weather changes, and the influence of moon and earth gravitation. The existence of mangrove forest can be one of the best solutions because it serves as a natural breakwaters. Mangrove forests can become protector and also barrier from the waves that hit the coastal area. Toyota Indonesia has been promoting Toyota Forest program since 2013 by planting mangrove trees in various regions in Indonesia. Toyota Forest program is a real movement of Toyota Indonesia Corporate Social Responsibility (CSR) with Supplier Group and Dealer in actualizing the awareness to the surrounding environment. 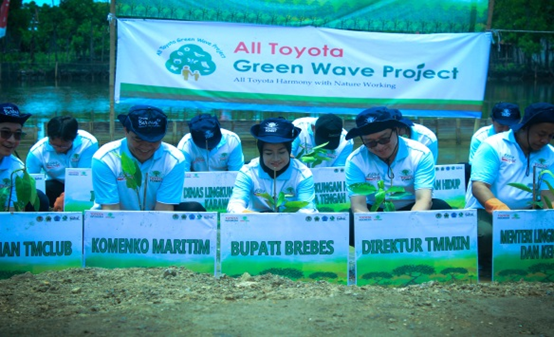 "Toyota Indonesia has set a target of 1,600,000 Toyota Forest activities by 2018. From these targets, nearly 1,300,000 trees, including 950,000 mangroves, have been planted and preserved in collaboration with local communities," said Bob Azam Director of Administration, Corporate & External Affairs Division on separate occasions. Toyota is committed to grow with the people of Indonesia in accordance with the spirit of Toyota Berbagi (Together Building Indonesia) through the supply of products and technology in accordance with customer needs, become the part of the national automotive industry development, and play an active role in social activities.